The Shimpo Aspire, a tabletop potter's wheel, can handle your most creative challenges. Its lightweight, compact design makes it easy to transport, and a 20 lb centering capacity makes it a practical addition to any studio or classroom. Available with either a hand lever or a foot pedal, the Aspire features a 1/3 HP, 100W DC motor, a 7" alloy wheel head, and a removable one-piece splash pan. Also included are two 9-3/4" bats. The Aspire's wheel head speed ranges from 0–230 rpm for the hand lever model and 0–250 for the foot pedal model. 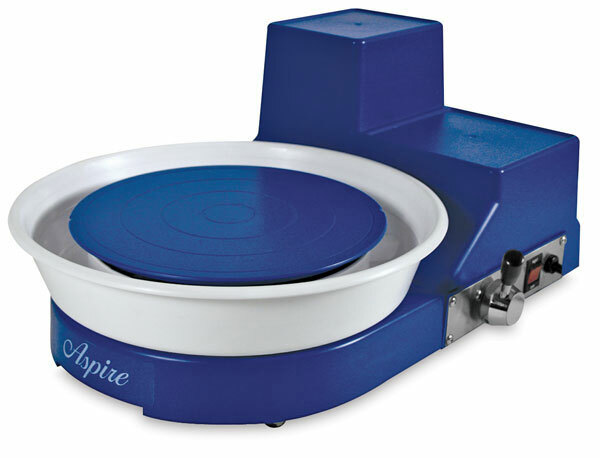 Both measure 9"H × 14-1/2"W × 20"L.
The Shimpo Aspire includes a five-year limited manufacturer's warranty. Amazing, affordable, accommodating … Aspire! Foot Pedal Conversion Kit — Convert your hand-operated Aspire pottery wheel into a foot-powered one! Easy to install, the foot pedal offers smooth, controlled speeds from 0–250 rpm. Electrical Warning — All electrical products have U.S. standard plugs and voltage. Due to damage that can occur when using incompatible plugs, sockets, or converters, Blick does not ship electrical items or accessories outside of North America or to freight forwarders. ® Shimpo is a registered trademark.